Here’s another pillow in the Made to Create series, all of which showcase different presser feet or accessories. This time we’re looking at Catherine Gross’ elegant tailored pillow which features Tailor Tack Foot #7. A “wall” in the center of the foot, used in conjunction with a zigzag stitch, produces a looped stitch. The stitches form over the raised center, then then loops fall off as the fabric moves out from underneath the presser foot. 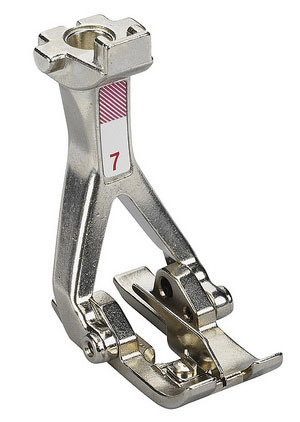 Originally designed for sewing tailor tacks – long strands of thread used for temporary marking of darts, notches, etc. 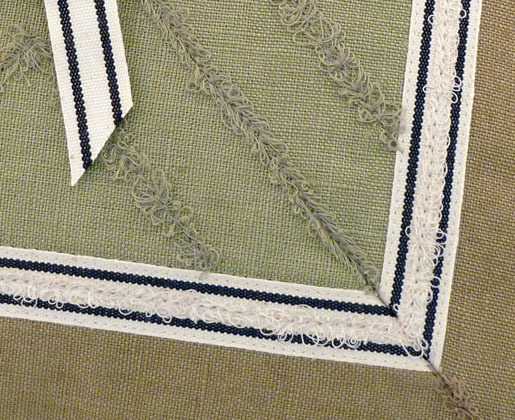 on fabric – this foot also has decorative applications, such as elegant fringe and hemstitching. 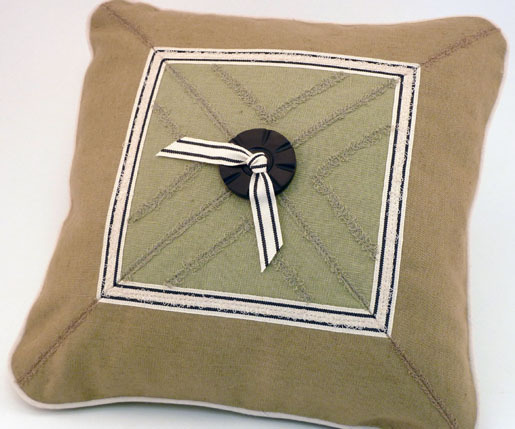 Careful matching of thread colors makes the fringe details on this pillow seem to be part of the fabric rather than applied stitches – off-white on the ribbon, green on the center of the pillow, and brown on the border. Tip: To keep the lines of stitching straight, place the center wall of the foot in the well of a seam where available; for other lines, use a straight edge and erasable fabric marker to draw lines parallel to the seamlines in the center of the pillow top. The button is attached with a length of ribbon. The center is tacked in the center of the pillow where the four seamlines cross, then threaded through the holes in the button and ties. Bonus: If your points don’t quite match, they will be hidden under the button! The dark button on this project is a nice foil for the dark lines in the ribbon.